Compania Națională de Transporturi Aeriene Române TAROM S.A., doing business as TAROM (pronounced "ta-rom"), is the flag carrier and oldest currently operating airline of Romania, based in Otopeni near Bucharest. Its headquarters and its main hub are at Henri Coandă International Airport. It is currently the second largest airline operating in Romania based on international destinations, international flights and the third largest measured by fleet size and passengers carried. The history of Romanian National Air Transport Company can be traced back from 1920, when CFRNA - (French-Romanian Company for Air Navigation) was founded. The airline used French-built Potez 15 aircraft for its passenger/mail service between Paris and Bucharest via several cities in Central Europe. In 1925, the city of Galați became the first destination in Romania served by regular flights followed, from 24 June 1926, by an extended service to Iași and Chișinău. Ten de Havilland DH.9 and five Ansaldo A.300, in addition to the Potez aircraft, operated the service. In 1928 the airline changed its name to SNNA (Serviciul Național de Navigație Aeriană, The National Air Navigation Service). In 1930, the company adopted the name LARES (Liniile Aeriene Române Exploatate de Stat, Romanian State-Operated Air Lines) while 1937 saw the merger of LARES with its competitor, SARTA (Societatea Anonimă Română de Transporturi Aeriene). Immediately After World War II, in 1945, when the Soviet Union had extended its influence across Eastern Europe, a new reorganization replaced LARES with TARS (Transporturi Aeriene Româno-Sovietice), jointly owned by the governments of Romania and the Soviet Union. Domestic operations were started from Bucharest (Băneasa Airport) on 1 February 1946, when TARS took over all air services and aircraft from LARES. 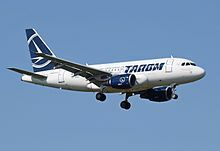 TAROM terminated loss-making domestic services to Craiova, Tulcea, Caransebeș, and Constanța, and focused its activity on service to key destinations in Europe and the Middle East. 2004 was the first profitable year of the last decade. Airbus A310-300 at Schiphol Airport in 2014. TAROM is recovering from a difficult period that began in the 1990s, when losses of up to $68 million per year were registered, caused by unprofitable routes. At the beginning of the new millennium, the airline initiated a programme that was aimed at restoring profitability. This was achieved by terminating loss-making intercontinental services. TAROM has decided to focus its operations on Bucharest (Henri Coandă International Airport) (OTP) and Cluj-Napoca International Airport (CLJ), and initiated direct international flights from Sibiu International Airport. On 4 November 1957, a TAROM Ilyushin Il-14, registration YR-PCC, operating an international administrative flight from Bucharest to Moscow crashed short of the runway at Vnukovo Airport, killing four of 16 on board. The aircraft was on approach to Vnukovo Airport when the pilot noticed that the aircraft was too low, however the aircraft continued its descent until it struck tree tops and later crashed. The aircraft was carrying Romanian government members Chivu Stoica, Grigore Preoteasa, Alexandru Moghioroş, Ştefan Voitec, Nicolae Ceauşescu, Leonte Răutu and Marin Năstase to Moscow for the 40th anniversary of the October Revolution. Preoteasa, who apparently was not wearing a safety belt, and three Soviet crew members lost their lives. On 9 October 1964, an Ilyushin Il-14, registration YR-ILB, operating a domestic scheduled flight from Timișoara to Bucharest broke apart in mid-air and crashed 2 km south of Cugir, killing all 31 on board. The aircraft had flown into a strong downdraft; the pilot attempted to maintain altitude, but this caused the fuselage to overstress and break apart. On 4 February 1970, TAROM Flight 35, an Antonov An-24, registration YR-AMT, operating a domestic scheduled flight from Bucharest to Oradea struck the side of a mountain in the Vlădeasa mountain group, killing 20 of 21 on board. The aircraft began descending in poor visibility until it struck tree tops on a mountain side, after which it struck the slope of a second mountain. The aircraft was leased from the Romanian government. On 5 September 1986, an Antonov An-24 registered YR-AMF operating on a domestic scheduled flight from Bucharest Băneasa Airport touched down nose wheel-first while landing at Cluj Airport. A fire erupted, killing three crew members who were trapped in the cockpit. The other two crew members and all fifty passengers survived. On 28 December 1989, during the Romanian revolution, an Antonov An-24 flying from Bucharest to Belgrade, carrying journalist Ian Henry Perry, was shot down by a missile at Vișina, Dâmbovița. All the people on board (six crew members and the passenger) died. On 13 August 1991, TAROM Flight 785A, an Ilyushin Il-18, flying from Otopeni to Timișoara Airport crashed in the Retezat mountains during a repositioning flight. The flight crew, and an aircraft maintenance crew, all consisting of 9 people, died instantly. Whilst the official cause of the crash was attribuited to pilot error (the pilots did not use radar instruments and only assumed their positions, thus getting lost), the secrecy regarding the crash sparked a few conspiracy theories, which include sabotage, accidental shootdown from a nearby surface-to-air missiles unit (theory later dismissed by the MApN), and UFOs that tricked the pilots into believeing they had arrived at their destination, linked to the sigthings of unusual lights on 4 August 1991. On 31 March 1995, a TAROM Airbus A310 operating as Flight 371 crashed near Balotești due to a fault in the throttles and lack of recovery from the flight crew. All 49 passengers and 11 crew members were killed. On 30 December 2007, a TAROM Boeing 737-300 (YR-BGC "Constanța"), flying Flight 3107 hit a car on the runway of Bucharest Henri Coandă International Airport while taking off for Sharm-el-Sheikh. The aircraft stopped beside the runway and was severely damaged. None of the passengers were injured. Because of fog, neither the tower nor the pilots saw the car belonging to staff who were repairing a runway beacon. ^ "TAROM, CREȘTERE TIMIDĂ A NUMĂRULUI DE PASAGERI ÎN 2016 (VIDEO) - NEWS AIR". 11 January 2017. Retrieved 25 May 2017. ^ "Compania aeriană de stat Tarom şi-a crescut traficul cu 20% în 2018, la 2,85 milioane de pasageri | Ziarul Financiar". ZF.ro (in Romanian). Retrieved 2019-01-11. ^ "TAROM, creştere cu 25% a afacerilor în ianuarie 2019; numărul de pasageri transportaţi, plus 17% | Agerpres". agrepres.ro (in Romanian). Retrieved 2009-03-07. ^ "Harta destinaţiilor TAROM - tarom.ro". www.tarom.ro. Retrieved 25 May 2017. ^ "Катастрофа Ил-14П авиакомпании Tarom в районе аэропорта Внуково" [Accident Tarom Il-14P Vnukovo Airport] (in Russian). airdisaster.ru. Retrieved 1 December 2015. ^ ""Nu înțeleg ce s-a întâmplat? De ce l-au lăsat să plece?". Pilotul Valter Jurcovan a murit la Revoluție în timp ce aducea sânge pentru răniți". Jurnalul.ro. 2011-12-12. Retrieved 2012-10-07. ^ "Raport preliminar al accidentului de pe Henri Coandă: lipsă de coordonare între turnul de control și echipă de balizaj". HotNews.ro. 2007-12-31. Retrieved 5 July 2010.